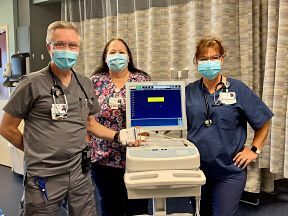 Dosher Foundation thanks The Orton Foundation for its latest grant of $25K toward new equipment in our Emergency Department. Photo by Anne Liles. Click Here to donate on-line to the Dosher Memorial Hospital Foundation. Ever since opening its doors in 1930, Dosher Memorial Hospital has received excellent financial support from its friends and neighbors in the community it serves. As the hospital has grown, however, increases in giving options, as well as the hospital's donor base, have created the need for a central channel through which funds may be received, recorded and allocated. To meet that need, the Dosher Memorial Hospital Foundation was established and began operating in March of 2010. The Foundation's primary responsibility is to encourage a steady flow of funds to the hospital from individuals and organizations within the hospital's service area. These funds enable Dosher Hospital to continue providing its patients with the finest healthcare equipment, programs and services possible...as well as provide the resources necessary for construction, expansion and remodeling projects. Contributions of any amount, and in honor of any occasion, are gratefully appreciated by the Foundation. For more information about the many ways you can make a tax-deductible donation, commemorative contribution, or become a member of the Dosher Memorial Hospital Foundation's annual giving program, please write to the address listed below, phone (910)457-3850, during normal business hours, Monday-Friday, or email us (foundation@dosher.org). Or, if you prefer, you may make an on-line contribution to the Foundation, via our secure server (www.dosher.org), using your credit card. It's easy and safe. Your gift to the Dosher Hospital Foundation will help to enhance the quality of healthcare made available to your friends, neighbors and loved ones through Dosher Memorial Hospital.